Neon Damsels are super bright and very metallic looking. They will literally glow under intense aquarium lighting. Neon Damselfish is two-tone in color with electric blue primarily on the top portion and bright yellow on the bottom and posterior portion. 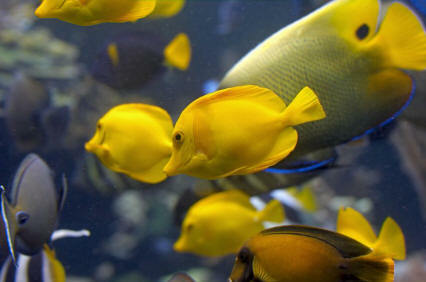 There is a considerable species variation in the amount of yellow on the body of the fish. Omnivore, Brine-The Neon Damsel will readily eat all kinds of live, frozen, and flake foods and algae. Finely chopped meaty foods (like brine shrimp) can be fed regularly. It is best to feed small amounts several times a day. In a reef situation they don't really need to be fed very often at all. 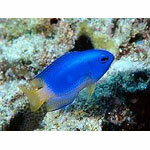 The neon damselfish species will spawn in the home aquarium; females lay their eggs in crevices or in shells. The males guard the neon damselfish eggs from potential predators. Damsels are renowned for their surly dispositions. But P. coelestis would have to be considered one of the mellowest of the pomacentrid clan. Not that it is above chastising new, peace-loving fish added to a smaller aquarium it happens to be in. 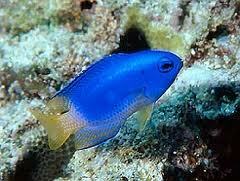 But in a moderate to large-sized aquarium the neon damselfish typically behaves itself. The most likely targets of the neon damselfish are small bottom-oriented species, such as dartfish, firefish, gobies, wormfish, small wrasses and dragonets. 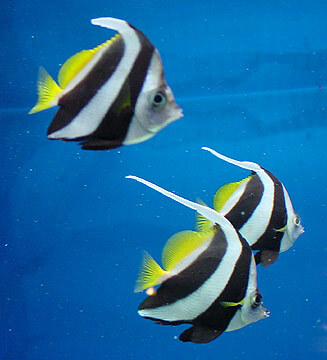 In larger aquariums (135 gallons or more), they can be kept in small groups. If you get two male neon damselfish, they will need to have enough room to set-up their own territories or, if room is lacking, you may have to remove one or more of these fish if they fight constantly. In many cases, adding a larger group (say five individuals) of P. coelestis is better because that will disperse aggressive interactions between more individuals. It will spend most of the time peering from holes and crevices, especially in well illuminated tanks.